Written with over 35 years of collecting experience, The Garage Sale Millionaire offers up all the need-to-know information and insider tips you’ll need to track down those hard to find treasures, hidden gems, and collectible items which, upon resale, will make you money. With the information provided in The Garage Sale Millionaire, you’ll have a definite advantage over your competition in buying, valuing, and selling your collectibles for substantial profits. The last chapter of The Garage Sale Millionaire takes all the information found in the book and binds it together to show you, by example, how to put on the best garage sale ever to make you the most money possible from your efforts. Additionally, The Garage Sale Millionaire includes the most in-depth glossary ever found in a book on the subject of collecting to date. At $22.95, The Garage Sale Millionaire was specifically written to be an invaluable resource for all collectors who consistently want to make money for many years to come. 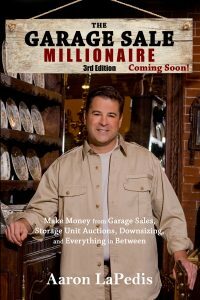 The Garage Sale Millionaire can be bought in many national book stores including Barnes and Noble, Costco, Sam’s Club, and is currently on amazon.com. Since the book’s release in March of 2010, it has won three awards; The International Book Award, The Best Books Award 2010 and The National Indie Excellence Book Award. The revised and updated 3rd edition is coming soon!